Kanhu alias Mangalji, who carried a reward of Rs 25 lakh on his head, and six members of his squad surrendered before the Police in his native village Jiyan. 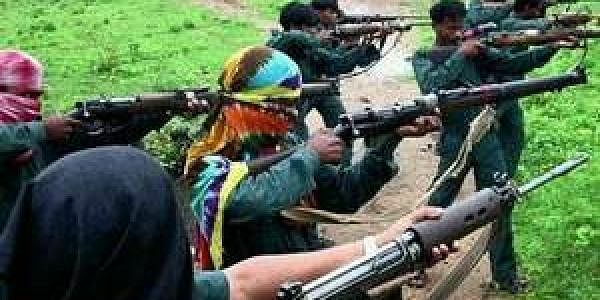 JAMSHEDPUR: The secretary of Bengal, Jharkhand and Odisha Border Regional Committee of the banned CPI (Maoists) Kanhu Munda has surrendered before the East Singhbhum district police along six members of his squad. Soon after his surrender, Munda today said the friendly approach of the Police as well as the Jharkhand government's appeal to shun violence and join the mainstream of the society, prompted him to lay down arms. Kanhu alias Mangalji, who carried a reward of Rs 25 lakh on his head, and six members of his squad surrendered before the Police in his native village Jiyan in Ghatsila sub-division. Talking to reporters after he was brought before the media at the Police Line here in presence of DIG (Kolhan) Prabhat Kumar, SSP Anoop T Mathew and Commandant of CRPF 193 battalion Shiv Kumar, Kanhu said "I had joined the Maoists about two decades ago due to police atrocities and lack of development in the rural pockets, but things have changed now. "There is electricity, roads and water in the rural areas and even the Police have become cooperative," he said. Jharkhand Chief Minister Raghubar Das has appealed the Maoists to join the mainstream and assist the government in carrying out development work. CRPF DG Durga Prasad had also assured of supporting the Maoists if they surrendered. Asked what prompted him to join the Maoists, Kanhu said a murder had occurred in his village, which led to police atrocities and villagers had to flee. The incident was one of the reasons he was attracted to the Maoists. Referring to the abduction of Block Development Officer, Dalbhumgarh in Ghatsila sub-division about seven years ago, Kanhu said the motive was only to send out a message to the administration that the Maoists were opposed to illegal arrest of innocent villagers and corruption. Asked about his future plans, Kanhu said he would continue to serve the society and did not rule out the possibility of joining politics. Hailing the decision of the Maoists to surrender, DIG Kumar described it as "historical day" for East Singhbhum as well as the state police. Kanhu was wanted by the Police in 47 Maoist-related cases, while 21 cases were pending against his aide Fogra Munda and ten cases against Jiten Munda in East Singhbhum district.